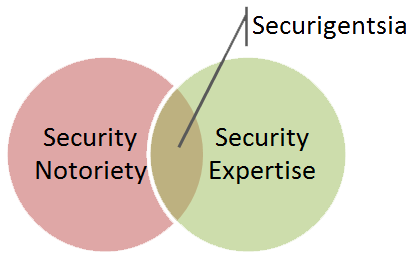 The information security community is comprised of many information security experts. Some of them enjoy public recognition of their expertise and form an informal group I call securigentsia. These individuals participate in meaningful public discourse and are generally perceived as improving the state and understanding of information security practices. As I continue to engage in writing and public speaking activities myself, I wonder: To what extent is being recognized for one’s expertise necessary for professional success? Is the quest for notoriety fueled merely by one’s vanity, or is this tactic essential to making a difference in the security industry? If an expert makes a discovery that can drastically improve the state and understanding of infosec practices, can he or she make a difference if no one hears about it? Writing on-line—assuming that the text is read by someone—is one way to gain public recognition of the person’s expertise. Growing one’s readership increases the likelihood of being heard. Having a respectable on-line persona has become essential for building one’s professional reputation. After all, it’s common practice to Google the person to find out who he or she is. In addition, building an on-line profile that describes one’s projects and achievements is critical for those who understand the decreasing importance of resumes during a job search. Even those who don’t feel right calling themselves “gurus” usually find it acceptable to create a professional bio that describes their accomplishments in a third voice and using a factual tone. The practice of including such bios in one’s profile has become commonplace. Another way of marketing oneself on-line without actively boasting one’s accomplishments is writing articles and releasing projects that people find useful, thus allowing one’s work to “speak” on behalf of its author. If you have expertise in a particular area of information security, you can contribute to the community’s knowledge base by sharing your insights. Similarly, information security experts striving for notoriety might get side-tracked. Gaining and maintaining the public’s attention takes effort that might divert the person’s attention from the domains where he or she achieved expertise. It’s strange to be writing about this topic when I am putting effort into researching and documenting security topics that, I hope, strengthen my own information security “brand.” Sorry for the somewhat disjointed thoughts on this matter, as I am still trying to make sense of the irresistible lure of notoriety.